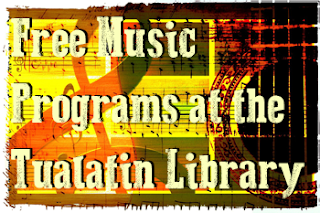 Feel the rhythm at the Tualatin Public Library this summer. Beat the heat while listening to some cool tunes on a Sunday afternoon. From jazz to folk to steel drums, there's something to satisfy every musical taste! All concerts are free and for all ages. Noted for the sweetness and wide range of his voice, Adlai Alexander performs with intricate guitar in a way that’s rare in both the acoustic and jazz worlds. Jazz, Bossa Nova and a 60s twist. Sunday, June 26 at 2:00 p.m.
An eclectic mix of musicians with a broad range of influences, combined with an exciting passion for music, Chris Garcia Jazz trio brings the perfect groove to the library. Sunday, July 10 at 2:00 p.m.
Two Spirit Jazz current repertoire comes from the American songbook and from the vast supply of American jazz and blues. Sunday, July 17 at 2:00 p.m. Boy and Bean are a swing/jazz trio that focuses on music from the 20s, 30s, and 40s. Sunday, July 24 at 2:00 p.m. The Doubleclicks are a nerd-folk musical duo consisting of sisters Angela and Aubrey Webber. They are known for performing nerd-friendly comedy music. Get your groove on at a live steel drums concert with Northwest Panman, Terry Baber.